Ideal for collage or scrapbooking projects. The plain wooden surface is suitable for painting and decoration. Features a sturdy wood chip backboard with hanging hook. Opening 15 x 15 cm (6x6") depth 2 cm. A vintage wooden picture frame. Due to age and use it has lost a little of the varnish on the base and the top edges are not as crisp as when they were made, but then as it is made from wood this is not surprising, no doubt photos being placed and removed over the years. 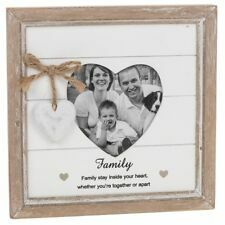 canvas pictures hearts size 20cm x 20cm or 30cmx40cm. Sweet home rose heart canvas red n white with foam roses and buttons. Also black and white ones take a look at my photos, Any colours you would like I can make and personalise to any words or names you choose. Size 20cm x 20cms for £5.99. Also 30cm x 40cm for £8.99 Msg me if interested in which ones or buy for a bargain. Thanks for looking. modern contemporary wooden picture/wood on wood 27x27cm. Condition is Used. Dispatched with Royal Mail 2nd Class. Multi-size Room Decor Wooden Picture Photo Wall Frame Square 5"/6"/7"/8"/10"
New Good Friends Stick Together Photo Frame By Kirdland's 8" x 9" holds 4" x 6"
picture frame with saying "NO ROAD IS TOO LONG WITH A GOOD FRIEND"